The development in Dublin 2 was held up for years due to a series of objections. 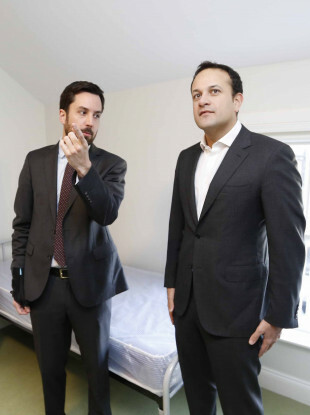 Leo Varadkar and Eoghan Murphy visit the new homeless facility at Longfields 10/11 Fitzwilliam Street Lower, Dublin 2. A FORMER HOTEL on Fitzwilliam Street, opposite the former ESB headquarters in Dublin 2, is to open as a homeless hostel this week. Taoiseach Leo Varadkar and Housing Minister Eoghan Murphy launched the Longfields hostel, which has 35 rooms and will be staffed 24/7. The hostel, which will be run by the Simon Community, will be used by single people, couples and those with mobility issues, said the minister this morning. The development has been in the works for some time, with Dublin City Council purchasing the Georgian buildings for almost €7 million in 2007. However, due to a number of objections and legal challenges, the development has faced significant delays. In 2015, Fine Gael TD Kate O’Connell (who was then a councillor) came in for criticism after referring to homelessness as a “buzz issue” during a council meeting in which the hostel was being discussed. That evening, Dublin City Council voted in favour of the new homeless hostel in the Georgian District. At the time, O’Connell said she would be voting against the proposal, stating that she was against spending €300,000 per bed. Speaking to TheJournal.ie in 2015, O’Connell explained that she voted against the proposal not out of nimby-ism, but for purely economic reasons. O’Connell said her use of the phrase ‘buzz issue’ was simply referring to homelessness as a “hot topic”. Some other councillors also objected to the hostel being developed “in an affluent location”. O’Connell told TheJournal.ie today that it wasn’t the location she took issue with, but that no net increase in beds was being provided in the proposals in front of her at the time in Dublin City Council. She also took issue with the council spending close to €10 million on the property, only to leave it idle for years. “They were hoping to retrofit it (a Georgian building) with a view to moving constituents of mine from a hostel on Harcourt Street into it. No new beds were being brought into the system. The hostel on Harcourt Street was being closed, we were told. No comprehensive budget or plan was provided for the proposal. “My constituents weren’t getting to move to a new home – they were being ‘promised’ another hostel bed in a shared space but with no end date in sight,” she said. O’Connell said Father Peter McVerry supported her position at the time and agreed that the council should focus on providing real housing solutions, not hostels. She said she gave the council examples of ready to go self-contained apartments that could be purchased to accommodate people in homes with immediate or almost immediate effect. “To me it seemed ludicrous that a complicated conversion of a Georgian building was a solution to what was an urgent immediate requirement for homes,” she added. When asked about politicians objecting to the development in Dublin 2, Murphy said it was important to have services for homeless people all over the city and not confined to just a few areas. He explained that the new hostel will have six-month tenancies for service users, their meals will be provided throughout the day and a nurse is available on site to address clients’ health needs. “While it is disappointing it has taken so long to get it up and running for a number of reasons, legal challenges as well, it is now open and it is a fantastic facility,” said the minister. I think it is important members of the local councils are allowed do their work and exercise their functions,” said Murphy, who added that it a matter for the council and its members to decide what buildings from the council stock should be used for. We identified this building as being appropriate because there is a demand here to help people off the streets into short-term supportive accommodation to more long-term accommodation and then into homes. “I can understand why councillors might have different views, they might bring them to the table on behalf of their constituents over what they think might be the right reasons, that is simply up to them, but from our point of view this is the right location,” said Murphy. Email “Former Georgian hotel in Dublin's city centre opens as hostel after years of objections ”. Feedback on “Former Georgian hotel in Dublin's city centre opens as hostel after years of objections ”.